To start, note that Glebe Point Road runs north-west from Parramatta Road to Glebe Point and, for much of its length, is along the ridge which separates the catchments of Blackwattle Creek (to the east) and Johnstons Creek to the west. Along the southern section, the ridge is a thin strip of Ashfield Shale (Wianamatta Group) overlying Hawkesbury Sandstone. North of Wigram Road, the ridge is Hawkesbury Sandstone. Try to imagine this location as it was before European settlement: a rocky outcrop with the land sloping away in three directions – to Blackwattle Bay, to Rozelle Bay at Glebe Point, and Johnstons Creek. There are still places in Middle Harbour which are similar to the way this site would have been 250 years ago. The Hawkesbury Sandstone is the rock formation underlying the man-made structures at this location and it is the formation which forms the cliffs of Sydney Harbour and the coastline from Dee Why to Wattamolla. The formation is dominantly a quartz-rich sandstone with sporadic lenses of shale and mudstone and was probably deposited in a braided river environment. It has a maximum thickness of approximately 250 m in the Sydney area and extends from Bundanoon in the south, to Woodford in the west, to Howes Valley in the north-west and to Gosford in the north. In the Sydney region the sandstone has been used extensively as a building material and fine examples of its use can be seen in the 19th century buildings of the Macquarie Street-Bridge Street precinct of the Sydney CBD. Walk north-east along Cook Street, towards Blackwattle Bay. Cohen, D and Taylor, G, 1999. South Coast Excursion. 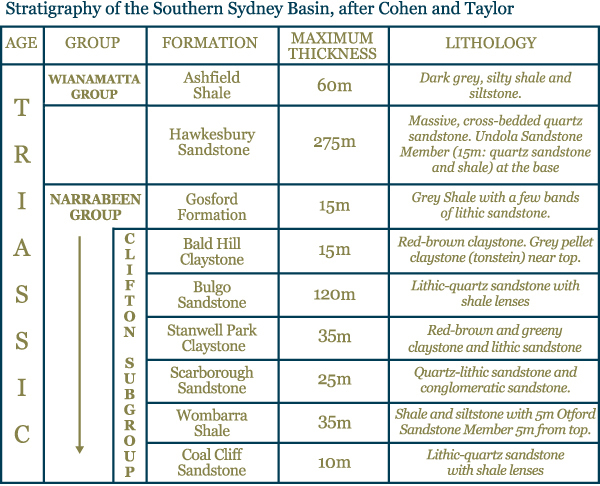 GEOL1111 - Earth Systems & Dynamics, University of New South Wales.